How Do You Spell Kayak? Home » Spelling Dictionary » How Do You Spell Kayak? 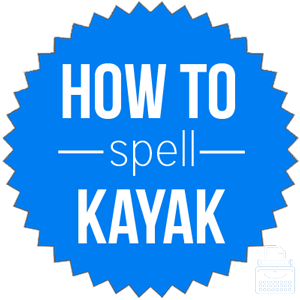 Spelling of Kayak: Kayak is spelled k-a-y-a-k. Definition of Kayak: A kayak is a boat, similar to a canoe, originally used by the Inuit. It is constructed with a light frame, often with a watertight covering that has a small opening in the top in which a person can sit. Kayak is also a verb that means to use or travel by kayak. Pronunciation of Kayak: Kayak is pronounced kī-ak, with the “kay-” sounding like “-k” + a long “-i”. What does mean? Kayak, as a noun, is a canoe-like boat that is pointed at both ends and requires the use of a double-ended paddle to propel it. While there are tandem kayaks, most are only single seaters. When referring to an individual who kayaks frequently, add an “-er” to the word to form the noun kayaker. The large waves caused her kayak to tip but she was an experienced kayaker so she used her skills to roll herself right side up again. This particular kayak is made for use in lakes, rivers, and oceans. When explaining the act of using or traveling in a kayak, it is used as a verb. The past tense of the verb is kayaked and the gerund is kayaking. Their friend from the city didn’t want to kayak because he was afraid the narrow boat would tip. As they were kayaking, a Humpback whale emerged from the depths of the ocean. The word kayak is a palindrome, meaning it is spelled the same forwards and backwards. Traditional Inuit and Yupik, (Eskimo), kayaks are made by stretching animal skins over a frame of wood or whalebone. According to Merriam-Webster’s, kayak was first used in the year 1757. The word originates from the Inuit word qayaq. Since kayak is the name of a specific type of boat, there are no synonyms for the word. Canoe is not synonymous with kayak as it is a different type of vessel. Invented by the Inuit people, a kayak is a narrow boat that is pointed at both ends and propelled by a single paddle. The word can act as both a noun and a verb.